one on the top left was probably cut from an even larger diamond. 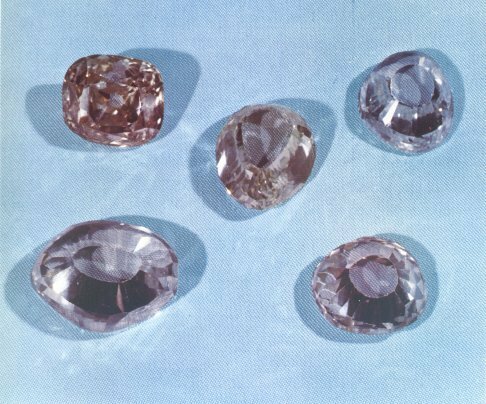 When the contents of the Iranian Treasury were opened up in the 1960s, the existence of three legendary Indian diamonds was revealed. They are the Darya-I-Nur, the Nur-Ul-Ain and the Taj-I-Mah. It has been conclusively proven that the first two diamonds had been cut from the same stone: the Great Table Diamond. The Taj-I-Mah, meaning 'Crown of the Moon', is an imposing stone and the largest unmounted Indian diamond in the collection. Most certainly of Golconda origin, it is irregular, Mogul cut, colorless and of the finest quality, slightly worn on top. The diamond weighs 115.06 (metric) carats and measures 32.0 × 24.3 × 14.7 mm. The presence of the Taj-I-Mah among the Crown Jewels in the Iranian capital had been known for a long time. The British administrator and diplomat Sir John Malcolm, who visited Persia in the 19th century, was allowed by Fath Ali Shah (1797-1834) to inspect the Regalia. He wrote: "Darya-I-Nur, or 'Sea of Light' weighs 186 carats, and is considered to be tha diamond of the finest lustre in the world. The Taj-I-Mah, or 'Crown of the Moon' is also a splendid diamond. It weighs 146 carats. These two are the principal in a pair of bracelets, valued at near a million sterling. Those in the crown are also extraordinary size and value." The two major diamonds in these bracelets, or armbands, is somewhat puzzling. Other travellers have specifically stated that the Koh-I-Noor was worn by Fath Ali Shah in one of his armbands. In this connection it is of interest to recall the fact that before the Koh-I-Noor was recut to its existing weight it weighed approximately 186 carats. Could it therefore have been the Koh-I-Noor rather than the Darya-I-Nur which was the companion diamond to the Taj-I-Mah in the ornament? It has always been stated that the Darya-I-Nur and the Taj-I-Mah were sister stones. This may have been true from a historical standpoint, but definitely not from a gemological one, since the Darya-I-Nur is light pink while the Taj-I-Mah is colorless. Indeed the color of the latter is much like that of the Koh-I-Noor, so they would have been well matched. Whatever may have been the truth about the jewel of Fath Ali Shah, there is no doubting the existence of three seperate diamonds today. With reguard to the discrepancy between the past and present weights of the Taj-I-Mah, it is quite possible that at some stage in its history the stone may have been recut. This is most likely to have taken place during the reign of Nasir ud-Din Shah (1848-96), the ruler who was responsible for the purchase of numerous large diamonds, clearly of South Africa origin, that are among the Iranian Crown Jewels, and for recutting some of his predecessor's acquisitions.